Our 6:30pm flight to Frankfurt on Lufthansa was good. Unfortunately, our flight to Vienna was delayed by an hour so by the time we got to Vienna we missed our connection to Dubrovnik. 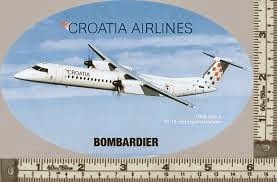 The only flight available was through Zagreb, which meant we had to kill 6 hours at the airport. With just three hours sleep and snoozes in the lounge we took a flight on a Croatian Air Bombardier Q400 prop-job to Zagreb and then an Airbus A320 to Dubrovnik. We got in at 10pm instead of 2pm . We had to go through a total of six security checks from start to finish. With a total travel time of 22hours, it was equivalent to flying to Australia. Our host was not able to meet us due to the delay but arranged for a taxi to meet us at the airport and get us to our apartment in Old Town Dubrovnik. Not an easy feat since cars are not permitted in Old Town so we humped our bags from the Pile Gate for six blocks and up a gazillion steps to our home for the next 5 days. It was 11pm when we went out to check the town and picked up some water for our morning coffee. Sleep came easy.